We are living in a culture that has forgotten the meaning and purpose of marriage in God’s plan for creation. Does your pastor know that the second Sunday in February is recognized by the US Bishops as World Marriage Sunday? It may not be celebrated in your parish unless you remind him and help him with resources we have developed for the occasion. Every Bishop received a letter encouraging the celebration of this special day from Archbishop Charles Chaput, Chairman of the USCCB Committee on Laity, Marriage, Family Life and Youth. As marriage reality protagonists, we look for every occasion in our families, communities and parishes to celebrate the goodness and beauty of God's plan for the family and try to create teaching movements. 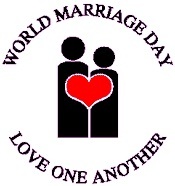 World Marriage Sunday provides a great opportunity to reflect on the reality of marriage and to celebrate marriages in our parish communities. It is particularly important to provide this witness for children who are increasingly bombarded with the notion that marriage is an institution for the happiness of adults separated from children and the family. Reintroducing the Reality of Marriage. Marriage is the free choice of a man and woman to make themselves irreplaceable to each other, to become a relative, described in scripture as becoming one flesh. It is this choice that prepares the couple, if so blessed, to receive a child as a gift. In reality, that child is irreplaceable to both the mother and the father, and the mother and father are irreplaceable to the child. Though it may not be evident to adults, the child knows that their mom and dad are also irreplaceable to each other, even if they living separately. True marriage is constituted by Reality (the will of God, the creator of reality) and the will of man and woman, who must choose to recognize and enter into it. When the reality of marriage is recognized by culture, religion or the state, it becomes the only institution that unites children with their mother and father. Through the benefit of revelation, Catholics have a deeper understanding of this reality, and through Christ, marriage has become a sacrament, an outward sign of a hidden reality. Download "Reintroducing the Reality of Marriage." Suggest marriage prayer intentions for the prayers of the faithful to your parish that focus on the truth about marriage and family. They may also be used in daily family prayer. Suggest to your pastor to have those men and women who have made themselves irreplaceable to each other through marriage stand, be recognized and receive a special blessing for their marriages. This could be introduced by reading the short description of marriage from above ("Reintroducing the Reality of Marriage"). Read and share the attached essays, “Celebration of Marriages in the Community,” on the reality of marriage or “Understating the Marriage ‘Commitment’". The first can be read at a marriage recognition event, as a reflection, or as background for a homily. Both are suitable to use for a home ceremony around the dinner table. Essential Elements of Catholic Marriage Vows can be used for reflection by couples wishing to renew their vows or by those considering marriage.